Recently I decided to invest in quality pantry storage. 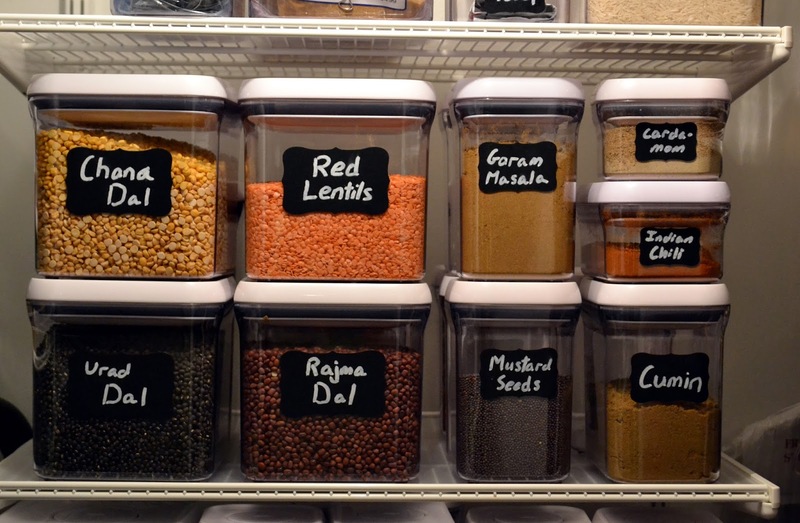 I accumulate a lot of great ingredients while shopping in New York’s terrific ethnic and specialty stores, and I needed a way to keep them fresh, organized, and accessible. I turned to OXO Good Grips POP Containers. They have a hard plastic exterior with lids that easily “pop” open and shut for an airtight seal. I chose them for the simple, space-saving design and durability, and the ability to stack them up to save precious storage space in my Brooklyn apartment, where my coat closet doubles as a pantry closet. The containers aren’t cheap, but I think they will pay for themselves. A lot of money is lost when food goes stale and has to be discarded, and saving ingredients in an airtight space really extends their useful lives. It also keeps pests out of my apartment because they can’t find anything to eat. To label the containers, I purchased an inexpensive set of chalkboard stickers ($11) and a liquid chalk marker ($5.50). 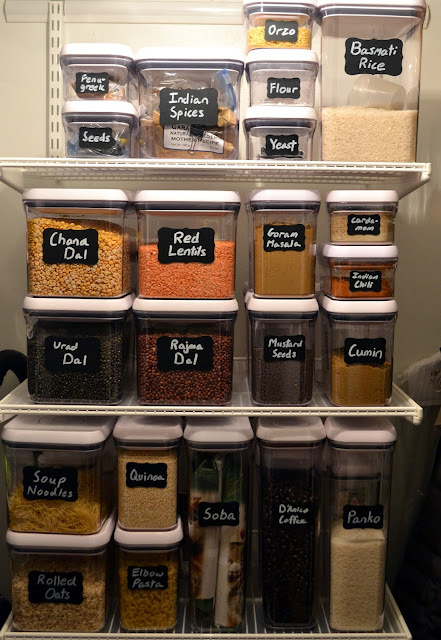 The writing erases easily with a damp paper towel so the containers can be re-labeled. It made for a fun arts-and-crafts project on a lazy Sunday afternoon. 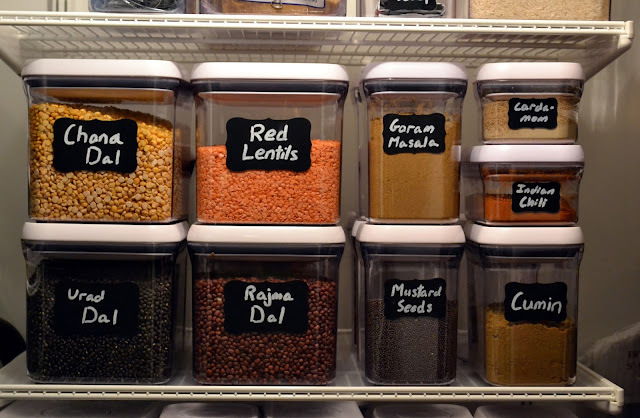 The containers come in many sizes: tiny containers for spices, tall skinny containers for spaghetti, big wide containers for rice or lentils. I started by buying a starter set of ten and then, once I figured out what my needs were, I supplemented it with different sized square and rectangle containers. I use the biggest containers to pile up random stuff that doesn’t fit anywhere else. 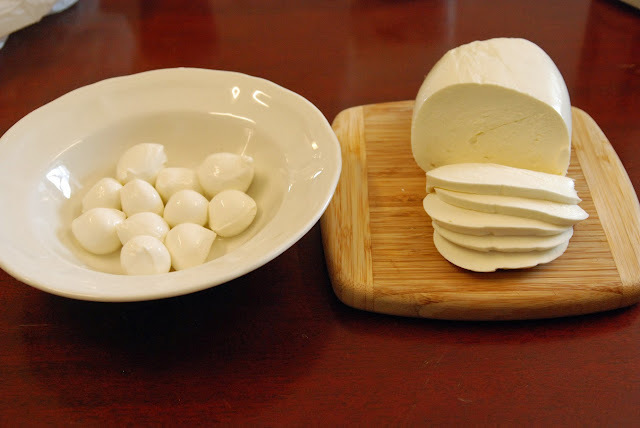 – They are airtight, which means the food lasts longer and stays safe from household pests. – They stack for clean, easy storage. – They are clear so I can see my ingredients inside. – They are solid and durable, so my investment will last a long time. – They are square, not round, which saves precious storage space.